By Jim Van Der Pol Kerkhoven, Minnesota — For years we have fed a little hay in winter to gestating sows by throwing a small bale in their bedding every few days. This is no big deal, especially when compared to the summer pasturing we have been doing for decades. Grain has long remained the major part of the winter gestation ration. But with major changes afoot with fuel and grain prices, we have decided to look closely and critically at forages with an eye to building a pig production practice that will be more durable going into the future. 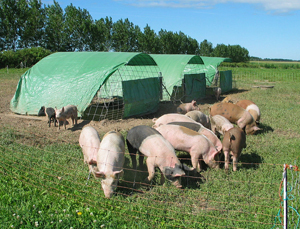 Sows are the place to start, as their systems seem to handle forage well, and we perceive that they benefit from it. We will have to figure our own way into this, as universities seem incapable of something as simple as reading a forage sample and applying it to a simple-stomached animal. So we start with the practical questions and, when we have a few principles in place, we will push the envelope and observe the sow herd for effects. How much hay can a sow eat? We know the daily digestive capacity of our sows tends to be around 13 lbs. of a mixed-grain ration. We know this because when we full-feed in lactation, this is about what they will clean up. But it is more the volume than the weight that fills an animal. The volume occupied by 13 lbs. of our sow feed is about three-tenths (0.3) of a cubic foot. When corrected to 18% moisture, one pound of our alfalfa/grass baleage fills six hundredths (0.06) of a cubic foot. Therefore we should be able to physically fill the sow with five pounds of hay every day if no grain is fed. That won’t happen anytime soon, but we do want to explore how low we can push the grain part of the ration by giving the sow access to good hay. To do that, we will want to feed the hay continuously while reducing the grain ration regularly. Five pounds of a corn-soy diet is typical for a dirt-lotted sow in winter. This does not fill her up, and it is always too quickly available, meaning she has a lot of “search and find” instinct left over each day. This is where they start dismantling the barn! Hay is a wonderful addition for this reason alone. So we have started with the five-pound ration while seeing how much hay the sows would eat from a cattle ring turned upside down. We found that 25 sows will get through a bale in about two weeks, wasting about 20% in the process. This comes to about 2.5-3.0 lbs. of hay/head consumed daily in addition to the 5 lbs. of grain, which is pretty close to the capacity figured above. We know we have to do something in the way of hay-feeder design to cut down on the waste, and we are pretty confident we can design something. It also must be said that the hay feeding this year is mostly outdoors, so daily intake has had as much to do with temperature and wind as it has appetite. Still, we feel these are fairly solid starting benchmarks. But what are the economics? If the farm’s hay is valued at $100/ton for 115 RFV, and corn is $6.00/bushel, the hay costs 5 cents/lb. and the hog feed about 14 cents. A sow eating 5 lbs. of a grain ration and 2.5 lbs. of hay will cost about 82.5 cents daily to feed. If we can cut her daily grain ration to 2 lbs., she should compensate by eating 4 lbs. of free-choice hay based on the above volume calculations. Daily feed cost would be 48 cents. But will she thrive, growing a decent-size litter of strong pigs and coming back to breed again after lactation? This is what we must find out, because these numbers are significant for our farm. Saving 34.5 cents in daily feed costs for a gestating sow adds up to about $10,000 annually when figured over 100 sows. We may be able to reduce the grain ration even more. We won’t know until we try. This is where it would be nice to be able to get solid numbers on the amounts of energy and protein in hay actually available to a hog. We will have to make our moves by observation and long term study. One problem we have involves how we feed the grain ration. We have several methods for feeding sows for different seasons of the year, and all of them are getting out of date in this time of high grain prices. One method is to feed along an electric fence in the winter. The fast eaters get more this way, but it keeps them from savaging each other and completely starving the submissive sows. A better way, during those months when the pasture is usable, is to scatter the ration over a long distance in the pasture. This evens out the intake somewhat, but not completely. We can also just throw several pails to them in the building during bad weather, and hope for the best. This method doesn’t work very well at all. The problem with all these cheap-grain solutions is that we end up feeding more than the group should have as a total in order to make sure we don’t have too many sows falling out the bottom. At 14 cents, even a single pound of extra daily grain per head costs about $40, or one pig/sow/year. 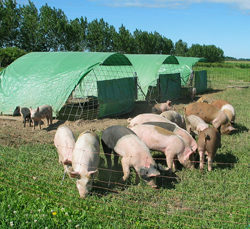 About 30% of the herd consistently gets more than its share, becoming fat and lazy and failing to care for their pigs. Another 20% may have trouble breeding back after weaning because they aren’t getting adequate feed. And this problem will get worse if we back down the grain, as the fast eaters will have it all cleaned up while the meeker sows are still looking for a safe place to eat. Come-and-go feeding stalls seem like a good option at this point. These allow the sows to be locked in during the time it takes them to eat their grain — generally less than a half-hour per day. This allows the meeker and thinner ones time to clean up in peace the bigger ration they are getting. This is pretty critical if we really mean to reduce the grain portion of the ration. And since the stalls open individually from the front, they serve as a kind of everyday sow sorter for individual breeding, AI, treatment of sickness, marketing open and cull sows, or whatever. Already we have converted one of our feeding hoops for a breeding area, and we are thinking of converting the one next to it to house mid-gestation sows as well as a set of feeding stalls situated so they could be used for all breeding and gestating sows in turn. Both of these sow areas would be equipped with built-in silage bale feeders so that hay would be on offer continuously during the off-pasture season. 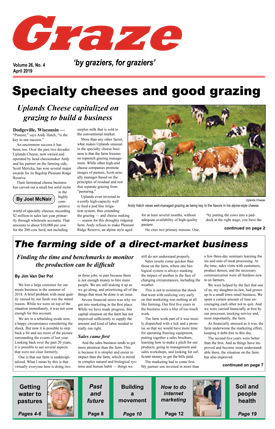 No hay will be fed during pasture season, as pasture is always cheaper. It is a nice coincidence that these hoops are situated at a pasture intersection, which allows us to send the sows out to pasture to graze along with the cattle anytime we choose, and allows them to come back for shade. While feeding hay this way does take more time, it also allows closer individual observation and should therefore result in fewer empty sows at the end of the breeding cycle. This aside, the capital investment required for the set-up would be paid for in two years of operation just by the savings from reducing the sow herd’s grain ration by 1 lb./day through reduced waste in the feeding stalls. Any gains from better breeding, better culling, or replacement of grain with hay in the diet would be extra. This should be a smart capital investment given the higher grain prices we seem to be facing. And it has good long term implications. If we can use this feeding stall set-up to help us reduce the gestation grain ration, we can begin to learn some things about how nearly a sow can support herself solely on pasture or good hay. We know that combination-grazing of hogs and cattle provides for better use of pasture. We know that sows reduce fly populations on pasture. We know that pastured sows have less difficulty at farrowing due to the forage-heavy diet and the extra exercise. These are reasons enough for pasturing, even though in our system it is difficult to figure just what the sows are eating in the pasture. And the possibility exists that a farm set up to restrict grain to sows while offering free-choice forage year-round will tend to push the animal’s genetics in the direction of perennial feeds, and away from annuals. That is exciting to think about.